How did the pet food industry begin? The Pet Food Industry - where did it all begin? Today's pets owe a great deal to a certain American, James Spratt who lived in Cincinnati, Ohio, towards the end of the 19th century. Before the advent of pet foods, most dogs and cats lived off of grains, meats, table scraps and homemade food from their owners. When James Spratt took a sea voyage to England his purpose was to sell lightning conductors to the British. But, by the time he returned home, he had embarked on a new career. The turning point in James Spratt's life - and in the lives of countless millions of pets - came when his ship docked in England. His attention was caught by the sight of dogs scavenging for discarded ships' biscuits on the quay side. James Spratt, in that moment, saw the need for specially prepared food for animals and turned his efforts to the production of dog biscuits. Early Customers were English country gentlemen who bought for their sporting dogs. US advertising ingenuity was not neglected since the first color display billboard was mounted on London retail stores depicting an American hunting scene with Indians slaughtering bison to provide the British market with buffalo meat for “Meat Fibrine” dog food. Spratt’s Patent, Limited, an English public company, was registered in 1885 to continue the business founded by James Spratt. And so the prepared pet food industry was born. Though it was an American who effectively invented the first dog food, it was Britain which monopolized the market for almost 50 years, until 1907, when the F. H. Bennett Biscuits Co. was established, introducing Milk-Bone dog biscuits as the first domestic canine food. 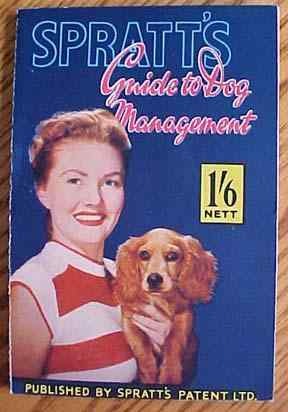 Despite considerable production problems, Bennett produced around 100 crackers and cake varieties, but failed to make much of an impact of the pet owning population of the US, as a result going into the red. So, as a health addict with a sincere interest in nutrition, Bennett began experimenting with specialties. One of the innovations that Bennetts can be credited for was addressing the whole nutrition issue, with a bone-shaped biscuit for dogs that he hoped would aid general health because of the extra gnawing involved. This was to sell a more complete biscuit food with nourishing ingredients to include meat, cereals, milk and food minerals fortified in liver oil, wheat germ and irradiated yeast to provide essential vitamins for dogs. 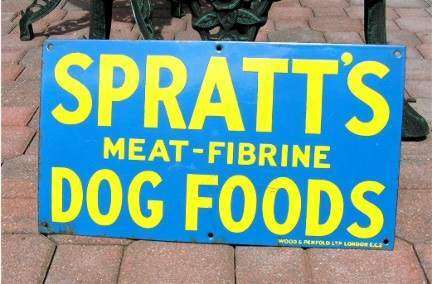 Until the 1920s commercial dog food meant one of two things, either Spratt’s or Milk-Bone. Unfortunately, because of consumer reluctance to change to these 'novel' foods products did not move quickly enough in the shops and a customer often found the contents green with mold, the fat turned rancid. 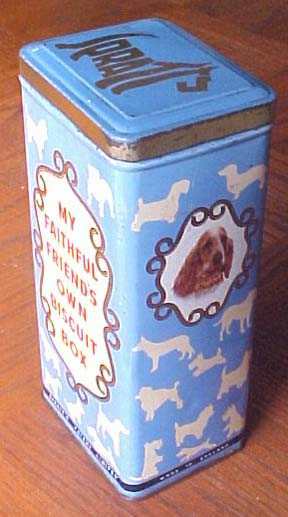 Later, US companies produced canned food for dogs, the most notorious perhaps being P. M. Chappel, an old time horse dealer and horse breeder with connections in the packing industry, who canned dog food made with horse meat under the Ken-L-Ration brand. The label carried a picture of dogs playing poker. There were three Chappel brothers and they could be found going along Chicago streets with cans of horsemeat trying to persuade owners of pet shops to display and use it. Customer reluctance to feed horse meat, and supply problems led them to change course, and they began to produce dry dog food. 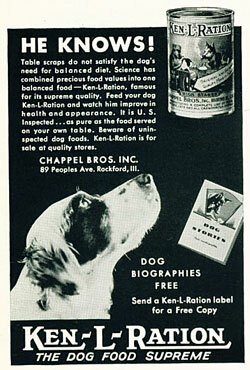 They also recommended feeding a mixture of dry dog with canned dog food - a trend which has continued to this day. Commercial production in the UK began in the 1930s when the Chappel Brothers began canning a meat and cereal food for dogs. In the 1950s Spratt's (still surviving in the market) became part of General Mills, and in 1960 it was bought by "Spillers" dog food company (a UK subsidiary of Purina which is owned by General Mills). Today Spillers makes "Bonio" biscuits which are very similar to those once manufactured by James Spratt. New debates were developing on feeding dogs, and several brand owners claimed that their products were superior and offered good value, because they were able to utilize cereal waste products and meat unusable for human consumption. Another argument was that fresh meat was just too expensive to feed dogs. Although acknowledging that fresh meat and vegetables were excellent foods, they argued that dogs could be fed more economically with these factory waste products, and still do well. In 1957 Ralston Purina introduced a whole new ball game by introducing expanded dog food. The expanded food offered a better palatability by the application of a fat coating on the kibble and a texture dogs liked. The increased bulk of the expanded product resulted in bags which looked much larger than previous foods —a feature supermarkets were quick to pick up on. Sales of these expanded foods boomed sales and encouraged others to jump onto the bandwagon. The next marketing strategy was in specialty diets, formulated for specific diseases or disorders in pets. The first diets were developed for kidney and heart disease in 1948. Dr Mark Morris DVM, founder of Hill’s Pet Products (Science Diet) was the first in the field to develop this idea. The Purina Company quickly followed, along with several others. Convenience was the first selling point for prepared and packaged dog foods. Scooping dry pieces of food into the dog’s food bowl was more time saving than cooking or preparing their pet’s dinner. Dog food companies began labeling their dog foods as complete, with no additional foods or supplements being necessary. The next trend in commercial pet food were “premium” dog foods, advertised as more nutritious, and offering different recipes for all stages of life, including seniors. This brought several new markets for pet foods, but no doubt more confusion to the pet owner. In the 1980’s, consumers were becoming more educated on nutrition for their own diets and reading labels on food products. With this information in hand, pet owners started reading the labels and questioning some of the ingredients in pet foods. The ingredients of most concern were chemical preservatives and antioxidants such as BHA, BHT and Ethoxiquin. Many pet food companies have now eliminated these chemicals from their foods, and are now using vitamin C and vitamin E. This has led to the next trend, which is marketing brands labeled as natural or holistic... and so the story continues today!